In the last few years fibromyalgia, neckpain and cataracts have been a part of the everyday life of Grethe Marie Jakobsen from the city of Trondheim. Now she is healed! In the last few years fibromyalgia, neckpain and cataracts have been a part of the everyday life of Grethe Marie Jakobsen from the city of Trondheim. Now she can enjoy a great eyesight and a body free of pain. Grethe Marie Jakobsen works as a nurse and a teacher in nursing in Trondheim. In the last four years she has experienced numerous health challenges, but she has always believed in healing. Already 43 years ago she was able to experience firsthand that God could do miracles. Grethe is Svein-Magne's sister-in-law, and was the first person Pedersen prayed for. It happened in July 1971 when Grethe was healed of flat-footedness. She has since come forward in the magazine Healing (no. 1 - 2011) and told her testimony, and she also participated in the television program "The Miracle is Yours." In the health care unit, one is skeptical to healing through prayer, but I know that it works, she says firmly. Grethe also experienced a miracle in 1993 when she was pregnant with her youngest daughter, Silje. During Grethe's earlier pregancies, she had struggled with large fibroids in the uterus, which meant that the risk of a spontaneous abortion was there. In December 1993, she went for a check-up, but her doctor did not tell her anything. As Christmas approached, she began to have labor pains even though she was only four months along. -I don't understand. When you were here last, you had a major bleeding, but I did not say anything. I thought you would miscarry. Now everything is fine, and the major fibroids have dried up. It shouldn't be possible. Grethe was delighted over the message, and 26 May 1994 her daughter, Silje was born. Although the flat feet healing in 1971 saved Grethe from many pains, the more recent years have been characterized by new painful challenges. In 2009, she slipped on the ice, which would have serious consequences for her life in the coming years. -I fell and almost did somersaults in the air before I landed on the ground. The result was a torn muscle in my shoulder and a damaged wrist and neck, she said. For one year, she was mostly on sick leave because of the injuries. The shoulder and wrist became functional again, but the pain in my neck kept getting worse. In 2010 she was granted a 25 percent disability pension. -Pain began to radiate forward towards my face and towards the eyes, and it hurt when I pressed on different points of the face. After a time I attended a course that taught me how to prevent and alleviate the symptoms. They found out that the movement radius in the neck was shorter towards the left than it was to the right. Every time I moved my neck, it hurt and I could hardly turn my head sideways or backwards. I dreaded every morning, because I was so stiff and sore after sleeping. During autumn 2013 Grethe got a new disturbing message. Right in the middle of excruciating pain in the neck, she was diagnosed with fibromyalgia, which is a chronic muscle pain disease. It probably came as a result of all the physical strain she had been through in recent years, and did not make matters any better. Grethe decided that no one should know about the disease. She only told her sister. -I refused to accept the situation, and instead of proclaiming the disease, I focused on Jesus. Everyday life was still difficult. I had electrical pain throughout the body. It also affected my sleep, and I often tossed and turned without being able to sleep. Working days were also challenging. 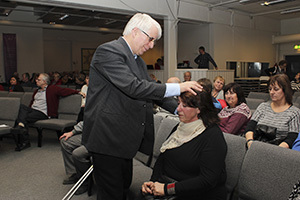 On Sunday February 2 this year Svein-Magne Pedersen came to Stjordal Mission Church and had a healing service. Grethe had not really thought of receiving prayer, but came with a friend who needed prayer. Regardless, she secured a queue number when she arrived. -To be honest, I was not optimistic. I thought others would be healed, but I wouldn't. But I was wrong, Grethe tells. When Pedersen prayed for her, she felt a little dizzy the first few seconds. She also felt a warmth that flowed up through the neck and arm, especially down the right side, where the muscle was torn earlier. -Suddenly I felt movement in my neck. There was a shift from one side to the other, as if God straightened up something, and the pain disappeared instantly. Also the pain associated with the fibromyalgia disappeared. It has been several weeks now, and I have not felt any of the symptoms. Lately there has been a lot to do at work, but my body has been fine. Two weeks after the visit to Stjordal, Grethe was to submit a new self-certification form and medical certificate on her health condition to the local Government Pension Fund concerning the disability insurance. Grethe wondered about what she was going to write, but to say that she was still sick, was out of the question. At the doctor's office, she told about what had happened. He looked at her in amazement and said: - We know about Pedersen, yes. Grethe also told about her flat feet, and said that many had been healed through Pedersen praying for them. - Yes, we are familiar with it, the doctor replied, and wondered what Grethe now would do regarding the disability insurance. He had never experienced someone who would call it off before. -I knew I would be missing 55,000 kroners a year if I submitted the form, and cancelled the disability pension, and that I would have to work more. I still wanted to be honest, and I submitted the letter to Government Pension Fund, where I wrote that I was healthy. The doctor would not send any statement. He most likely did not know what he was going to write. Instead he asked them to call him if they wondered about the reason for the drastic change in Grethe's health. But Grethe's story does not end here. In addition to all the pain in the last few years, she had also lived with another health issue. Two years ago she had been to the eye doctor for an examination. He discovered that Grethe had a chronic inflammation of the hair follicles around the eyes. -In about two years from now you will have developed cataracts, was the evaluation of the physician. Grethe was of course very concerned. She was a nurse and also a teacher of nurses, and having poor vision would create challenges at work. She also noticed that her vision was getting worse, since there was a film that covered her right eye, and she blinked a lot. -I also thought about the future, and all the plans I had for my retirement. I did not dare to drive a car or ride a bike. When I was shopping at the store, it was difficult to read the price tags on the items, and I had to wear glasses. Also when I read magazines and newspapers my eyesight became worse with time. I had several pairs of cheap glasses around my neck, but avoided eye glasses from the eye doctor. I had a quiet confidence that something would happen. Grethe did not mention the vision problems to anyone. Instead she focused on Jesus. 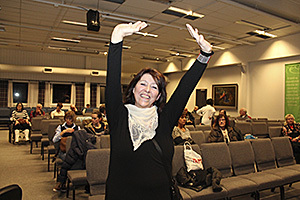 Every time Svein-Magne Pedersens television program, "The Miracle is Yours", aired on Vision Norway, she watched it. When Pedersen prayed for the sick, she always walked over to the television and placed her hand on the screen. She was always quiet and hopeful, and never lost courage. -I ended up with some stains on the screen. One day I was going to do some cleaning, I could not understand who had made all the finger marks on the TV screen. Then I remembered all the times I had put my hand on the television screen while Svein-Magne Pedersen had been praying. In the end of January this year, Grethe went for an another appointment at the eye doctor. Then the eye sight was just fine, and she only needed computer glasses. Grethe was very surprised and asked about the cataracts. -No, there is not any sign of cataracts, the doctor replied. -I am so grateful for what has happened. In retrospect I discovered that I could read without glasses too. God is good, and I am not in doubt about my healing. I am certain that there is a great secret in not proclaiming the disease around, but rather giving it to Jesus at once. We must trust that He will take care of it His way, in His time, as long as we are open for His power. -Now I also have a far greater opportunity to meet others with disease and ailments where they are. This was a useful schooling as a nurse and teacher of nursing, Grethe concludes. ROTATION: When Svein-Magne Pedersen prayed for Grethe in Stjordal, she felt a shift in the neck, and the neck pain disappeared instantly.